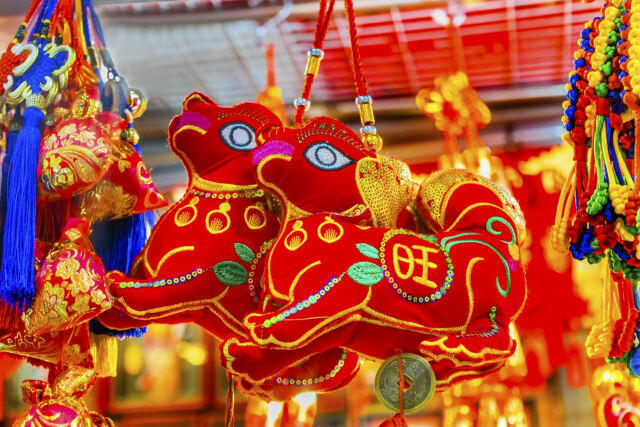 Which Chinese New Year animal are you? Answer one question to find out! You were born in the year of the rat! Rats are ambitious, wary, honest, angered easily, thrifty, and overly critical. You were born in the year of the ox! Ox's are honest, unyielding, stubborn, natural-born leaders, patient, inspiring, easy-going and conservative. You were born in the year of the tiger! Tigers are sensitive yet aggressive, daring, unpredictable, charming, openly emotional, courageous. You were born in the year of the rabbit! Rabbits are caring, talented, gracious, value peace, are sentimental, cautious and conservative. You were born in the year of the dragon! Dragons are intelligent, talented, imaginative, bossy, garish, and enthusiastic. You were born in the year of the snake! Snakes are clever, animated, determined, romantic, intense, charming, intuitive, prone to procrastination, vain and penny-pinchers. You were born in the year of the horse! Horses are hardworking, intelligent, gregarious, cheerful, popular, impatient, selfish, cunning and energetic. You were born in the year of the goat! Goats are creative, passionate, elegant, kind, honest, apprehensive, scattered, and vulnerable. You were born in the year of the monkey! Monkies are intelligent, innovative, clever, entertaining, alluring, opportunist. You were born in the year of the rooster! Roosters are brave, diligent, shrewd, arrogant, reckless, selfish, boastful and eccentric. You were born in the year of the dog! Dogs are honest, intelligent, generous, stubborn, loyal, introverted, diligent, anxious, and critical. You were born in the year of the pig! Pigs are curious, reliable, sincere, patient, affectionate, kind, impulsive, and naive.